Soon after arriving at school, though, Titus makes a shocking discovery, one that throws into question everything he believed about their mission. Faced with this revelation, Iolanthe struggles to come to terms with her new role, while Titus must choose between following his mother’s prophecies—or forging a divergent path to an unknowable future. I read this book in basically one day. I won’t say I was totally sucked in by the story or the writing–mainly I was really angry at one plot line and HAD to see it resolved. I still enjoyed reading the book, though, and the plot line I originally hated actually ended up adding to the story. Chapters in this book alternate between two plot lines, one that runs sometime in the future after the other one. Okay, that’s kind of a confusing way to explain it. Basically, every other chapter is the plot line you expect: Iolanthe and Titus reunite at Eton and continue their quest to defeat the Bane. However, alternating between those chapters are chapters that take place sometime in the future that the original chapters are approaching as the book continues. This other plot line involves Iolanthe and Titus stranded in a desert–with no memory of who they are, except that they need to stay out of Atlantis’s grasp. Though I didn’t expect to, I really enjoyed the “amnesia” plot line. I loved watching Iolanthe and Titus interact with each other (and fall in love, of course) when they had no idea who either of them were. Their banter remained, and the dramatic irony of the scenes made most of these chapters humorous in nature. Their flight from Atlantis made sure that the chapters were action-packed, and I loved seeing the two magicians figure out what they were capable of. The Eton plot line was a lot more similar to the previous book’s plot. The dramatic reveal that the plot synopsis mentions pissed me off so much. I can’t believe the author did that. As I mentioned before, I basically hate read most of those chapters, just to see it resolved. The resolution added to the story: Iolanthe’s character faced an identity crisis that forced her to reevaluate her priorities, and Titus’s faith in his mother’s visions caused him strife. The “truth” of the plot line ended up being appropriately shocking. I guess I forgive Thomas for the plot line’s beginnings. I loved the themes of paradox and memory loss that ran through the story. Seeing Iolanthe and Titus research and learn about memory spells in the Eton plot line added a sense of foreboding to the story, because of course that would be involved in the mysterious scene that connected the Eton plot to the amnesia/desert plot. We also got to learn more about Iolanthe and her past; unfortunately, this reveal was very convoluted and I was left confused even when all of the truth had come out. The paradoxes created by visions of the future also presented conflict in The Perilous Sea. I love paradoxes, and I appreciate that Thomas addressed some of the issues Titus’s mother’s visions had in regards to reality. Without that portion of the plot, it would have felt like too much of the book was illogical; as it stands now, the illogical portions of the book add to the book with their acknowledged paradoxical nature. I didn’t find there to be anything amazing about the writing of The Perilous Sea. It isn’t badly written, but there were no sentences or descriptions that really grabbed me and made me focus on their construction. 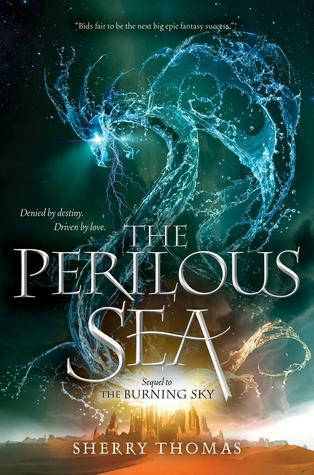 The action scenes were dramatic and got my heart racing, and I liked the magical and fantasy elements in this book as much as I did in The Burning Sky. Some of the setting or fight scene descriptions got confusing, but for the most part I could understand what was going on. None of the background characters are exceedingly complex, but they added to the story enough that I didn’t care. 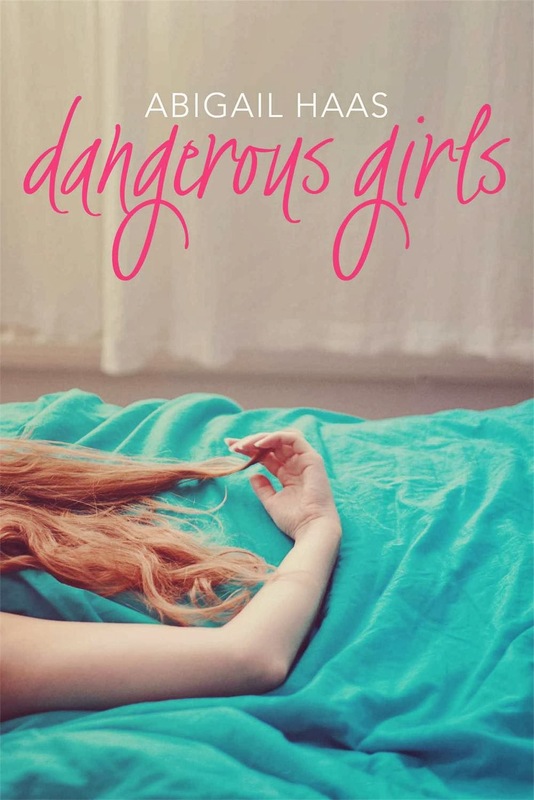 There were a lot of reveals and plot twists, all of which surprised me at least a little. The ending of the book got me really excited for the next one, The Immortal Heights (I have to wait until October?!). I would recommend this series to fans of YA fantasy who love action scenes and like dramatic plot twists (that they might hate at first). I held off from reading this book during the school year because I knew I would want to read it all in one sitting–and that’s exactly what happened when I picked it up this summer. Let’s start off with this: this book is crazy. It is crazy and it takes you hostage and it doesn’t let you go. I read this book in one sitting, only taking breaks for meals. I couldn’t put it down, because I had this ever-present and mounting sense of dread and I just had to get to the ending because I knew I wouldn’t know the truth until basically the last page. In that regard, this book was everything a thriller/mystery is supposed to be. The book is a massive series of flashbacks and flash-forewards, telling the story of how Anna and Elise became friends all the way through their fateful vacation and up until the trial for Elise’s murder. Some of the scenes were long and clearly explained what was going on, others were shorter and more vague, while others were told in alternative formats, like interview transcripts. I was amazed at that fact that I never got lost; usually with books like this, you start to lose track of where you are and what has happened, but even though this book’s chronology had basically been put in a food processor, it was easy to follow as a reader. I loved how the scenes flowed together across the timeline and how throughout the book we just kept learning more about Anna’s life, even the parts we thought we understood from the beginning. Character-wise, this book is a mixed bag. I had a strong sense of Anna as a protagonist and I felt like I understood the things inside of her that drove her to party as wildly as she did with Elise and the rest of them. Elise, likewise, was clearly portrayed in my mind–she was as alive and vibrant as any character I’ve read about. I can’t say that I really liked or trusted Elise, but I appreciated that I didn’t like her–it fit with the story’s mood. The same goes for the rest of Anna’s friends. They were simplistically characterized but they all added an important voice to the story, and under the stress of the murder case they showed that they were not flawless humans (really they were what you would expect from the spoiled kids of uber-rich parents). During the flashback scenes, I liked watching them party and grow close, but I didn’t want to be them, and throughout the story there was always the threat that one of them could be a killer and the rest of them we’re loyal enough to tell the truth. The characters involved in the trial were more interesting for me. There are not words for the helpless anger and frustration I felt against the prosecuting police officer, Dekker. He was the ultimate evil figure in power, and I loved/hated the way he painted Anna’s life to make her look like a murderer. The judge was a tiny beam of hope throughout the book. I trusted that she would be fair, but I also knew that Dekker was doing his job so well that fair would probably still condemn Anna. The news media’s take on the case fit perfectly with what I would expect if this happened in real life, and it was another voice of distrust that I ended up hating for Anna’s sake. Anna’s lawyers were equally kind and despicable, and I liked that we got to see doubt about her innocence even from the people who were supposed to be fighting for her. It was little details like that that ensured that the book had a feeling of realism and that I kept believing that this book could actually happen in real life. As a cautionary tale, this book works wonders. Wow, let’s just say: trust issues. With friends, with foreign law enforcement, with lawyers, with news media. I doubt I will ever spend spring break in Aruba–it would just be too weird after reading this book. But I need to rant about the ending, so from this point on, THE REVIEW CONTAINS SPOILERS. Do not read on if you haven’t read the book! The ending really angered me. At first. The more I think about it, the more little pieces of the plot click into place and I see everything in a new light. But still, the ending was too sudden for me–it came out of the blue, and it had to do that, but at the same time, I wish I had had more of a sense of foreboding leading up to it. I had spent the entire book, while everyone calls her a psychopath, countering it with the knowledge that I, as the reader, had the unique awareness that I was in her head. I had the truth, and she was feeling broken up and destroyed by the things happening to her, she was just the kind of person who could shut it down in the name of being “strong.” Having all of that turned on its head in the last five pages left me distinctly unsatisfied. As I’ve said, it was the only ending the book could have. Looking back on the story, Anna had to be the killer, or the entire plot would have been waste. None of that makes me less annoyed at the ending. Half of me loves the ending. Finding out that you’ve been inside the head of a psychopath for the last 350+ pages is crazy and hair-raising in just the right ways. I want to reread the book and see if I pick up on clues, if I can tell that she is faking it. But half of me wants more from the ending, so this book gets 4 stars instead of 5 stars. However, it still goes down as an incredibly impressive book, one that I will recommend to basically everyone. I found the body by tripping over it. In my defense, it was six in the morning. I wasn’t wearing my glasses and I hadn’t had my coffee yet. I hadn’t even gone to the bathroom yet, because the corpse was lying on its stomach in front of my bedroom door. It was while I was sprawled on the ground, blood slowly soaking into my pajamas, my ankle aching, that things started making sense. The coffee pot was gurgling downstairs and my house smelled like cinnamon rolls. The radio was on, volume just low enough that I couldn’t tell what they were talking about. “Good morning to you to,” I muttered as I limped into the kitchen, not surprised to find Jack sitting at my counter. I turned my radio off and turned to look at the one person who had dared to intrude into my new life. He was wearing dark jeans and a black shirt, no sign of his hunting gear except for a knife peaking out of his hiking boot. “I wasn’t wearing my glasses,” I said, pouring myself a cup of coffee, not bothering with sugar or milk. I needed to wake up. I glanced at Jack, who had moved on to smirking at my bed head. I should have brushed my hair. “See what?” I asked, cracking the oven open to peak at my breakfast. He just stared at me as everything slowly clicked into place. All the stories, all the rumors. He hadn’t believed them, apparently. Idiot. Lost, he glanced around my kitchen, taking in the normalcy of it. No specially carved blades in my knife rack, no protective potions in my spice collection. It was the house of a normal college graduate who couldn’t get a job with her major—though few people had quite as niche of a major as mine. “You really left,” he says, almost a question. Jack’s silence was broken by my timer going off. I slapped it to shut it up and took the baking pan out of the oven. This book is probably the best book I’ve read this year. It was a gripping story that read almost like a thriller without ever losing its fairytale roots. This book grabbed me from page one. It sounds cliche, but it’s true–I could not stop reading. I seriously considered pulling an all-nighter to read it. The next morning (after I got some sleep, because I really can’t stay up that late) I started reading it again, and I didn’t stop until the afternoon when I absolutely had to for social obligations. I finished it the next morning (and I want MORE). From the first page there was something addictive about the writing, the voice, the promise of the story. The story then just built and built, dragging me along, getting darker and more intense until I could not imagine putting it down. I haven’t been so completely at the mercy of a book in a long time. I liked that the story didn’t spend a lot of time before the Dragon took Agnieszka to his tower. There was just enough backstory for me to get a sense Agnieszka’s roots and then the story focused on what really mattered: her life in the Dragon’s tower. Agnieszka was the right protagonist for the story. She started out timid and prone to sobbing, but even from the beginning she had a powerful moral compass and just enough bravery to keep her to it, as well as a fiery temper that she couldn’t always control. Her growth was clear throughout the tale, but she never changed so much that I didn’t recognize the girl who began the story. Her interactions with the Dragon helped her develop her character; I loved that even though on the surface she was acting like a damsel in distress, she never really gave up or earned my pity. Agnieszka is one of those protagonists who is strong without knowing how to fight or even having social skills–and I loved her for it. Both the Dragon and Agnieszka have magic. The Dragon takes Agnieszka instead of Kasia (who everyone assumed he would take) to his tower in order to teach her how to use her magic, which she hadn’t even known she possessed. It was a slow and grueling process, but the magical dynamic that developed from her training was my favorite part of the book. Agnieszka’s magic is unique in the world of magicians. The way she harnessed it perfectly worked with her country roots and added a uniqueness to the story that it would have lacked if the author hadn’t expanded the magic into something that could be harnessed multiple different ways. The conflicts between Agnieszka and the Dragon from their different magical styles added depth to their relationship and started to pull at my heartstrings. The plot of the book centers around the menacing forest called the Wood that looms near Agnieszka’s village. It is the Dragon’s task to keep it from encroaching forward and to fight off its harmful magic that drives people insane and turns them into monster. I loved how at the beginning of the book the Wood was this simple, static evil, but by the end it was an omnipresent horror that was always one step ahead of the protagonists. Scenes in the Wood or involving its evil powers were honestly scary and gave the book the feel of a sort of fantasy thriller. The “fight” scenes in Uprooted were graphic and horrifying, and Novik did not spare the reader an understanding of the body count. The Wood’s menace propelled the plot along as the full scope of its powers and reach were made clear. Uprooted is so beautifully written. The writing style is effortless–you don’t realize how well-written it is until you realize you’ve been reading for hours and you didn’t even feel the time pass. All of the background characters were interesting and developed through the story. They came across as deeply human, and their flaws were always understandable because they were framed around human emotions and desires. I was glad that there were never so many characters that I lost track of who was who, even though the book is very long and the plot takes place across multiple settings. The romantic element of the book was subtle but powerful: though only a few scenes were directly related to the romance, I was seriously emotionally tied to seeing it play out. Part of the thrall of the romance was that throughout the entire story, it was such a small part of the plot that I never felt that it was guaranteed to end the way I wanted it to. Up til the last page, I was doubting that the couple would end up together, and it was breaking my heart. 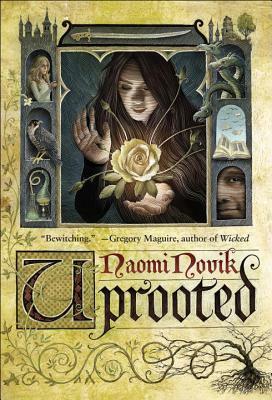 I was very satisfied by the ending of Uprooted. It could have been cheesy, but somehow it wasn’t. The character growth Agnieszka experienced was clear and the “solution” they finally found for the Wood fit the overall theme of the book. My only complaint is that this book needed an epilogue. I literally reread the last page five times trying to glean more emotional satisfaction out of it. It is a happy ending, but I wanted to bask in the happiness a little while longer. *I recieved a copy of Uprooted from KT Communications in exchange for an honest review. Second Draft Journal #1: Now What? Since December 2014, I’ve been working on the second draft of my work in progress, Devil May Care. It is a YA paranormal romance with a heavy dose of social commentary, based in a world where everyone is born with a devil on their shoulder, signifying them to embody one of thirteen sins. I’ve written about my WIP in random posts on this blog since then, but now I’m starting a series of posts strictly dedicated to logging my journey to a second (and better) version of this novel. It’s called my Second Draft Journal and it will talk about everything from writers block to character arcs, from social commentary to plot development. Here’s the first installment. After two months of not touching the word document “Devil May Care take 2” because of school and stress, I finally opened it back up. After I had a mini heart attack while I waited for all of the pages to load (I always feel like pages will randomly go missing), I started in on the arduous process of reacquainting myself with the 50,000 words I’d already written. This involved reading all 148 pages and creating a plot spreadsheet for myself to keep track of everything (something I had been too lazy to do earlier in the year). I’ve talked about using Excel to organize plots before; basically each cell is a scene and each row is a day. I also created a spreadsheet to keep track of my characters, and I brought back the one I was using to keep track of how many words I write a day. The plot chart is color-coded based on how much I liked each scene. Dark green is the best, dark red is the worst, lighter shades of each represent somewhere in between, and gray is for scenes I just don’t care about. I love that this gives me a visual layout of the areas of the book I need to fix and the areas where I hit a groove and everything works. Eventually I’ll copy the spreadsheet and color-code it by what each scene is about (which subplot it moves along), but right now I’m just trying to keep track of which scenes I like, which ones I hate, and which ones are just whatever. Yes, I am a little crazy when it comes to excel. I never learned how to do math with it, but I know how to do this really well. Is this foreshadowing or just giving it away??? Lots of question marks, not a lot of answers. I have to start writing again. And the scary thing is that tracking the colors of my spreadsheet, the quality of my writing has been steadily improving, which is what happens when you get into the habit of writing and get comfortable with your piece’s voice and start to gain some confidence. But I got out of that habit. Now I’ve got a blank page and the sick feeling that anything I write at this point will be noticeably shaky compared to what came before. Which is a confidence killer if ever there was one. And look how wrong I was. This book was unique and exciting, but there was something missing that kept it from being all-out amazing. Let me just say off the bat that the plot summary does a horrible job of explaining what happens in this book, mainly because it is a really complex book with lots of subplots and even more world-building and it is hard to decide where spoilers begin for a story like this. I’m trying to give you guys a sense of the book and its strengths and weaknesses without spoilers, but I have to gloss over big parts of the plot. This book surprised me. The fantasy elements were done well and with a unique fairytale spin. Both Titus and Iolanthe could work magic, but their powers were different in what they could do with their powers. I liked this part of the plot–Titus ended up actually seeming like he was a better magician than the great mage Iolanthe, which complicated their relationship, giving Titus some power and testing Iolanthe’s character. However, the reason behind the differences–though it was explained–never made sense to me. The explanations happened too early on in the book, before we had been introduced to either type of magic, and when the types of magic actually tried to fight each other, I was left confused, trying to remember vague explanations that I had glossed over, assuming they would be explained better when I actually needed the information. It wasn’t bad world-building, but it was somewhat sloppy, and if it had been explained at a more opportune time, I could have spent less of the book being confused and more of it loving the world Thomas had created. The setting–though it is more fair to say the settings, because the book takes place across three “realms”–is believable, complex, and overall bolsters the story’s strengths. Some of the book takes place in the magical part of Earth, and some of it takes place in non-magical England. I liked the power dynamic of the magical world: Titus is technically the ruler of the Domain (though he has a regent), but a foreign group of manipulators (Atlantis) has basically taken over the country, robbing Titus of any real power. Titus’s frustration and righteous need to take back his kingdom was understandable and characterized him well. With the addition of failed uprisings connected to his mother (who then died for the cause), and his duty to keep Iolanthe safe, Titus ended up with a complex and interesting character. He was more than a love interest, which I really appreciated, especially when the romance of the book was a little cliche. The plot line that takes place in non-magical England bothered me. It involves an all-boys school and struck me as unrealistic, to say the least. (I am being purposefully vague to avoid spoilers, by the way.) I liked the friendships Iolanthe developed and how it strained her relationship with Titus, but overall it was too disconnected from the rest of the book and from the strong sense of believability that dominated the other two settings and their plotlines. The rest of the book takes place in a fairytale realm called the Crucible, which is not actually reality and that Titus uses to train Iolanthe for her confrontation with the land’s magical tyrant, the Bane. This was an amazing idea, and the execution was overall great, but sometimes the descriptions of the setting would be confusingly worded. Also, the physics of the Crucible seemed a little far-fetched (especially near the end when the author changed all the rules), and it felt like Thomas was just coming up with rules that suited what he wanted to happen in the plot, whether or not those fit with the rules he had outlined at the beginning. Still, the scenes in the Crucible were by far my favorites to read; they made the rest of the plot lines almost feel like they were getting in the way of the story I wanted to read, when really the Crucible plot should have been the least important plot line. Iolanthe (why does her name have to be so complicated to type???) was a strong protagonist. She had a simple life before Titus crashed into it, claiming she is destined to be the greatest mage of the time and to take down the invincible Bane. She wanted to hold onto her simple life; she refused to sacrifice her life on a suicide mission against a tyrant who she didn’t actually hate. Her character had just enough ego and doubt–they played off each other to keep her honest and opened her up to the reader. The plot of this book is fast-paced and dramatic. The beginning was slow for me–there was a lot of world-building a little to early–but once the plot really started, I was hooked. I can’t say that the plot was anything super unique or complex, but with the world and the magic it was based in, it still ended up feeling special. From the romance I draw my one clear complaint with the book: there is Instalove. Or, not really instalove, more like insta-attraction. They aren’t in love with each other from page one, but as soon as they meet, large portions of each scene are focused on the characters thinking about each other in romantically interested ways. It came off as heavy-handed for me, which was a shame, because once the plot developed further and their relationship grew more complex, the romance that they shared ended up being really sweet and realistic. However, the insta-attraction at the beginning lessened the quality of the writing and almost made me put it down. I would recommend this book to fans of YA fantasy who want a well-done, unique novel that strays off the beaten path with complex characters and interesting power struggles. 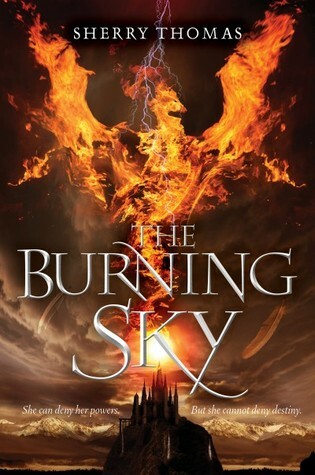 I would also say that being a forgiving reader would help, so that you can see past the technical issues I had with The Burning Sky to enjoy the amazing story it contains.